The European Union has made a request for modernization of its FTA with South Korea, which became effective in July 2011. The concept of modernization differs from renegotiation, which refers to a change in the structure of an FTA itself. However, experts point out that the request may be a step that will lead to renegotiation in the end with global trade environments changing fast these days with regard to Brexit and CPTPP expansion led by Japan. EU Ambassador Michael Reiterer met with Deputy Prime Minister Hong Nam-ki on April 4 to make the request. “We need to improve the South Korea-EU FTA to the levels of the European Union’s recent FTAs with Canada and Japan,” Reiterer said. “Discussions will be possible if mutual interests coincide,” Hong remarked in response. 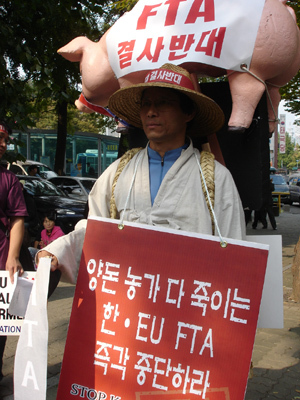 The FTA between South Korea and the European Union became effective in 2011. The European Union is one of the top three trade partners for South Korea with the United States and China. The Korea Customs Service recently announced that the rate of utilization of the FTA was 86.7 percent on the export side and 76.4 percent on the import side last year. On the export side, the rate is second only to South Korea’s FTA with Canada. On the import side, the rate is eighth-highest behind Chile, Columbia, Vietnam and other countries. The rate of utilization is very high in that South Korea has concluded FTAs with 52 countries so far. Professor Jung In-kyo at the Department of International Trade of Inha University said that the request is to upgrade the FTA’s provisions lagging behind today’s industrial and trade environments characterized by the advent of the big data era and so on. Some others point out the request is a preparation for future renegotiation and further market opening. This is because renegotiation with a European Union without the United Kingdom seems to be inevitable.